Law of the Garbage Truck – by David J. Pollay – CDs or MP3 – Discount! How often does a bad driver, rude waiter, curt boss, or an insensitive relative ruin your day with a thoughtless action, an angry rant, or a snide remark? And how often have you ruined someone else’s day? 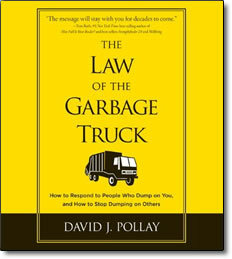 In The Law of the Garbage Truck, David J. Pollay shows us that by refusing to let others dump their “garbage” (negativity, anger, resentment) on us—and letting it “pass by” instead—we become happier and more successful, both personally and professionally. And when we stop dumping garbage on others, we improve our relationships, strengthen our businesses, and bring our communities together. Twenty years ago, while riding in a New York City taxi, syndicated columnist and business consultant David J. Pollay narrowly escaped a life-threatening car crash. The driver who almost caused the accident started yelling at the cab driver, who remarkably just smiled, waved, and wished him well. Pollay asked how the cabbie could remain so calm, and his response sparked the defining principle of The Law of the Garbage Truck. Many people are like garbage trucks. They run around full of garbage, full of frustration, full of anger, and full of disappointment…And if you let them, they’ll dump it on you. So when someone wants to dump on you, don’t take it personally…move on.